The Blue Dome is a unique, sustainable hotel blending modern design and cozy ambiance with truly eco-conscious practice. Is a beach front complex of 39 apartments located in the picturesque village of Platanias, 11 km west of Chania, Crete. 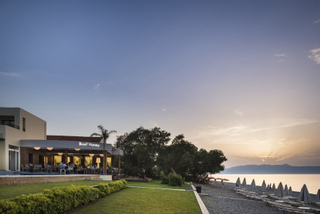 The new restaurant, Basil'Honey features an "à la carte" menu of modern Cretan dishes, a wide range of Cretan wines and delicious desserts based on the finest ingredients provided by small local producers.